So, I just burnt a black pair of pants I use at work and in church. It’s one of the 5 pants I had tailor-made this year that actually fits and whose zipper works but then, life happens. You know what I was doing when the incident happened? I was googling tips on how to safely operate a steam iron! Seriously. I bought a new one for our house in Bulacan last weekend, similar model to the one I have in our condo though I had always used it as a dry iron. It’s saddening and it scared me a bit because even after I turned the iron off, the burning continued, with smoke quickly filling up half the room. Good thing I did some a lot of shopping yester night. Before I lost, I already gained. Could it be that subconsciously I was thinking I have no need of those pair of pants aymore? Enough of this. I’ll let it go from here on. Sometimes, when I like a melody, I don’t want to know the exact lyrics of the song. I invent words which seems more personal according to my interpretation of the music.It’s just that this time, I can love both lyrics and melody. Last Sunday, we were commissioned again as Lectors and Commentators. It’s an annual thing. It was a Sunday like any other special Sunday. That is, before the 11AM Mass started. When we started walking down the aisle it felt, different. I cried silently because of joy. There’s something about more than 50 of us, dressed in the same garb, and me just staring at the altar while walking straightly an approximate of 200m stretch. The opening song also has lyrics of Christ being the “joy in our song” and it just moved me because it’s indeed true. He is the joy in my song! The newly commissioned Lectors and Commentators (Leccom) of Immaculate Concepcion Parish. It’s the second year of us being commissioned on a Sunday right after St. Pope John Paul II’s Feast on October 22. He is our patron saint. I must say it’s a blessing to have this Leccom family. Aside from being given the privilege of serving Him which I so not deserve, I get to know a lot of people, a way of God bringing me back to the society much like what He did to a leper (that’s another story). Honestly, I’m really bad at names and facial recognition. Years of being an introvert killed those brain cells responsible for good social skills. But the few that I know, are all a mix of interesting, kind-hearted sinners who continuously opens up their hearts to the Lord. Pretty much all of them are my mentors, trust-worthy substitute and volunteers of aid to my weakness. Pretty much all of us are a mess as well. When people ask how my weekend went, and when I tell them that I sometimes attend one Sunday mass three times, and they tell me that I might get way past heaven, I just accept that as a pleasantly-said snide remark because we both don’t know any better way to react. You should have seen how disorganized we were come lunch time after the commissioning and you can say that that’s how pretty much messed up our lives are too. But then, nobody promised that life following Jesus is ever going to be easy. As the song above goes: We’re all lost but found, we were blind but now we see. For two years now, our ministry arranges the exhibit for the feast of St. John Paul II. 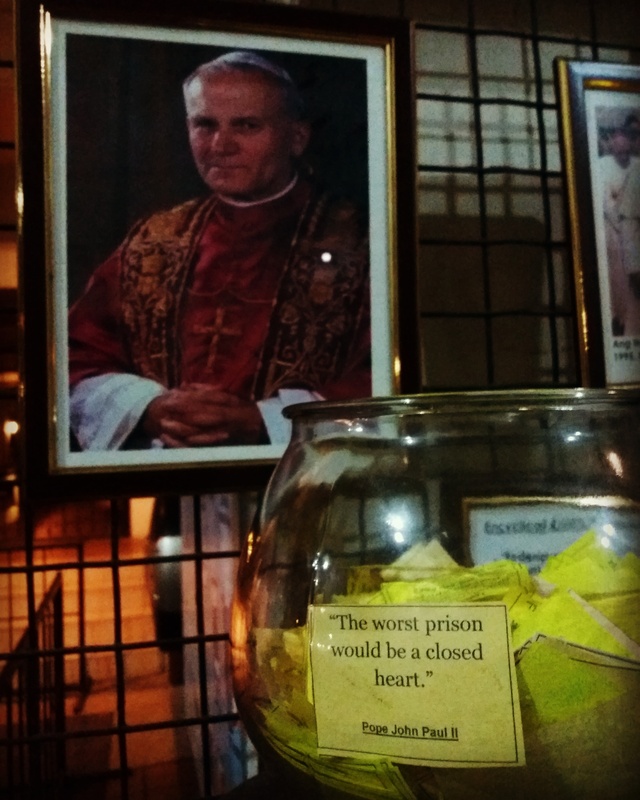 This fishbowl of quotes is a part of the exhibit and the displayed one, of a dear priest’s homily. In my case, fatigue is still my number one enemy when it comes to this ministry. There are mornings when I really have to battle it out with the devil just so I can wake up out of bed. There are times when I’ll sleep at 2AM and have to wake up at 4AM, then travel more than 2 hours to reach the cathedral. I work in the corporate world and sometimes I feel like this ministry is meant for retirees. But as Ate Conching said, “The Holy Spirit wakes me.” Whoah! I never thought of it before. Like I wake up out of my own free will, from my own strength. It took one Ate Conching, a co-lector to tell me that it is God’s amazing grace manifesting every waking hour of each day. Father Mameng, our rector and the priest who commissioned us, said, ” Hindi ka lektor dahil maganda ang boses mo o dahil gandang-ganda ka sa sarili mo. (You’re not a lector because you have great voice or because you think you’re beautiful). I know each one of us, especially those who have served for decades now find deeper and more meaningful reasons already. For me, not walking away from God’s grace is one. Serving also paved the way to teach me how to be thankful, to let go of burnt things no matter how much I thought I needed them – because now I know that I really don’t; to recognize God working in all of our lives every day starting every morning and even in our sleep. All the pieces, broken and scattered, in mercy gathered, mended and whole. I’ve been set free and I’m not going back. Never again. Never again to that worst prison which is a closed heart.